On 13 October we celebrate World Sight Day (WSD) to focus global attention on blindness and vision impairment. For most of us, being visually impaired means going to an optometrist and having the correct glasses prescribed. Unfortunately, thousands of people in South Africa, and millions globally, do not have access to these services due to a lack of funds or services in their areas. Despite the fact that the restoration of sight and blindness prevention strategies have been proved to be amongst the most cost-effective interventions in healthcare, according to the International Agency for the Prevention of Blindness. A joint report published in June of this year by the World Economic Forum, the Schwab Foundation for Social Entrepreneurship, and EYElliance, states the world economy suffers a $227 billion shortfall every year due to lost productivity among adults who need glasses. According to the report 2.5 billion people are living with poor vision unnecessarily because they do not have corrective eyewear. Of these, 80% are living in developing countries. Providing affordable access to reading glasses alone would boost productivity by up to 34% and bring down levels of illiteracy, which costs the global economy $1.19 trillion a year. The effects of not having access to eye care and reading glasses are equally disruptive to children and can lead to impaired academic, sport and social performance. For this reason, a visual screening is included in the Integrated School Health Policy for children of all ages attending South African schools. The government has also implemented a mobile primary healthcare service, where mobile clinics travel to rural schools to deliver these services. At the moment, the company at the forefront of this drive is Mobile Schools Health (MSH), a subsidiary of Mobile Satellite Technologies (MST), the market leader in the provision and operation of specialised mobile vehicle solutions in South Africa. According to MST CEO, Fernando Acafrao, they create beneficial public-private partnerships between the government and sponsors such as Eskom and Nedbank. Thanks to partnerships like these, MSH is currently operating 11 mobile clinics in the Western Cape, Mpumalanga, Gauteng and KwaZulu-Natal. 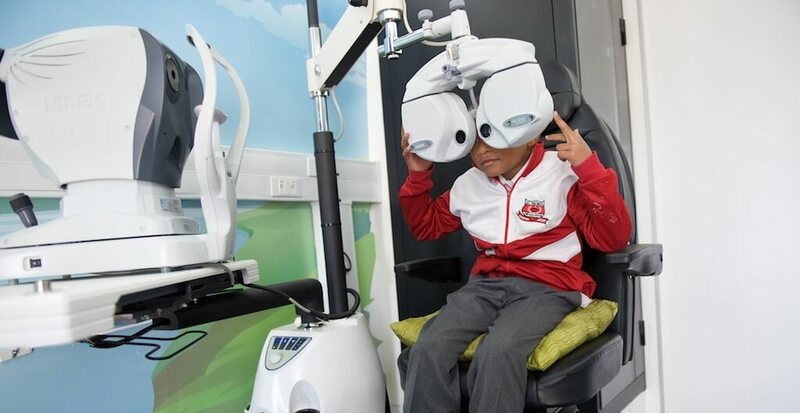 In the Western Cape alone, the company is screening an average of 200 children per week and in the first half of 2016 over 5% of all learners screened in this province were referred to receive glasses. Resident MSH optometrist, Motobi Selopyane has provided 151 children with glasses in 2016. Each child receives a follow-up visit after six months and, according to Selopyane the feedback is overwhelmingly positive. “The children’s grades improve and they have the potential to a better life. A pair of glasses makes a big difference in their lives,” he says. “If you go to a school in a township or a rural area you don’t see one kid with glasses, and you don’t see one teacher with glasses, it’s the blind leading the blind. No-one puts value to supplying glasses to this demographic but there is huge supporting documentation that it’s probably the single biggest thing that can increase gross domestic product,” says Acafrao. MSH’s vision is to increase their offering and, by 2020, have 100 vehicles operational in all nine provinces and treat 1 million learners per year in order to have a real and lasting impact on the future of South Africa.